Scrivener for large creative projects. Miscellaneous antivirus and system tools. I was very pleased that the OS installation took only about 20 minutes. My 2009 upgrade from Vista to 7 took at least an hour. And I remember installs of XP taking a lot longer than that. I once had to re-install 95, and it took half the night. My first PC ran Windows 95 and the HDD was 6gb. My new disc is a terabyte – 1000gb – and I have another 1tb external drive. So here I have 333.3 times as much capacity. That’s something, huh? Progress … you gotta love it. Because we’ve all got a lot of stuff. Ironically, I don’t think I’ll be storing much on the drive. I have about 80gb of music and podcasts I need to sync with the iPod, but everything else is in The Cloud now. I just think it’s funny that as we’re getting bigger drives for ourselves, we’re learning that keeping our files in a central location online just makes more sense. I remarked to my family today that this might be the last monster of a desktop PC I need to have. The format of computers is changing drastically. I recently wrote a poem using Google Drive on my iPhone. I write rough drafts with my Nexus 7 pretty often now. … It’s a brave new weird. I’m a big fan of Google. The Internet’s best search engine has grown into the world’s biggest and best advertising company, and in the process has come to offer all sorts of great stuff for us. Their brand features make a lot of what I do easier and more fun, with reliability that sets the industry standard. Next up on Google’s long list of cool features is Google Drive, a new cloud storage/sync service and their answer to Dropbox and Box. Rumor has had it for a while now that Google would offer 2GB storage for free, the same as Dropbox but less than Box, which offers 5GB. The rumor now – based on what is alleged to be a leaked screenshot of the impending product – is that users will each get 5GB free. You can follow the link to see the screenshot. I’m not going to post it, because it’s copyrighted by Google, whether TalkAndroid puts their big watermark on it or not. My first reaction on reading this was, “Oh boy, this is so cool!” because I love Dropbox. Through special promotions and referral bonuses I’ve gradually increased my limit from 2GB to 4. Having 5 more from Google would be sweet. My second reaction was, “Wait a minute, how did this get leaked?” Assuming it’s real. It didn’t fall out of someone’s pocket or briefcase. It came from a computer. At Google. Where they keep a lot of my private stuff: email, calendar data, docs, etc. How does a leak like this happen at a place like that? Either somebody at Google isn’t trustworthy, or Google leaked this on purpose for business reasons that elude me. Or it’s fake. In any case, it’s suspicious. Like something way back in the fridge, that just doesn’t smell right. What do you think? Can we trust Google with our stuff, if Google can’t trust Google with their own stuff? Or is somebody just up to nefarious shenanigans? I’ve posted on the topic of file sharing before. It’s one of my pet peeves, and it causes a lot of problems for others as well. On the other hand, getting videos and music from friends and loved ones can be a real pleasure if done properly. Here’s a fine article on the topic by Sherman E. DeForest at Lockergnome.com, one of the longest-running and most respected sites for geeky insight on the Net. My personal opinion, which Sherman seems to share in pertinent part, is that Skydrive is your best bet for long term storage and sharing. It works unilaterally; you put your stuff out there where people can get it, and send a link to make it happen. Dropbox is great for short term sharing (because its capacity is more limited, and you’ll want to free up the space) and bilateral – synchronized – sharing. With Dropbox, both parties sharing the files need to install a bit of software that creates a shared folder for them. Or you can put the file in Dropbox’s Public folder and share a direct and private link.That works great, but only one way. If you want to share large files with others, you need to find a way to do it that works for you, besides sending the files in emails. As the Lockergnome piece explains, it frequently doesn’t work, and it’s really just bad manners. Why is it bad? Imagine you answer your doorbell and find a friend standing there, saying he’s brought a little gift for you. You’re happy to see him, right? Now imagine the gift is the size of a football field, and he’s trying to cram it into your house. The unannounced visit just got uncomfortable. It might have been better if he’d left it outside. 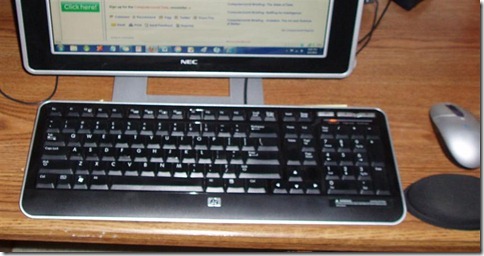 Back in April 2010, I posted about the bad ergonomics of PC keyboards. I opined that they’re bad because the number pad (10 key) on the right end of the keyboard forces the mouse to play way off to the side. This causes stress to my wrist, fatigue in my arm, and an occasional generally bad attitude. I threatened to obtain a smaller keyboard to solve this problem, and I finally did. It arrived on Friday. Here’s a photo of my old keyboard, an HP which came with my computer. See how wide it is? Almost 18 inches. There are things I like about it, especially the double size Delete button and the speaker controls. See how much smaller it is? 12.5 inches wide. It’s the same size as typing parts of a standard desktop keyboard, but everything is grouped the the same as the keyboard on a standard laptop. 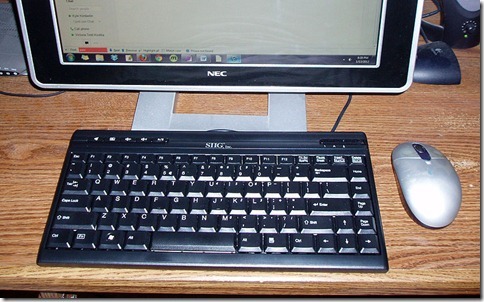 The mouse is closer to the keyboard, and the typing keys are more in line with the monitor. I’ve had it for 2 days and I’m still getting used to it, but so far it’s pretty cool. It’s just the right size for typing, if that’s what you do. If you need to do accounting, or other significant work with numbers, it’s not for you. But it’s pretty fine for writing. The SIIG JK-US0312-S1 USB Mini Multimedia Keyboard is sold by Amazon for about $20. The customer reviews are a little better than the A4 Tech KL-5 Mini Slim Compact Keyboard, which goes for about $16. So if you find the number pad on the right side of your keyboard mostly useless and in your way, there you go.